Vivian Maier is the Chicago-area nanny whose stunning street photography came to light only after her death. For the last two years, her work has been mired in a legal tangle but a settlement appears to have been reached over the celebrated photographs. It's a legal saga that's crossed continents but the final decision over ownership, copyright and proceeds of her work is being hammered out in Cook County, where Maier lived for more than 50 years. While John Maloof owns most of the negatives, the dispute is over who owns the copyright to Maier’s images. Maloof hired genealogists to track down a living heir to Maier’s estate, and he found a first cousin once removed who accepted $5,000 in exchange for giving up the rights to Maier’s work. David Deal, a Virginia copyright attorney and amateur photographer, read about Maier and Maloof, and “took an immediate interest in it,” said Chicago Tribune reporter Jason Meisner, who has been following the Maier legal battle. Deal took it upon himself to track down another heir, and he found yet another man believed to be Maier’s first cousin once removed: Francis Baille. In 2014, Deal filed a petition in Cook County on behalf of Baille, asking the court to name Baille an heir to Maier’s estate. While Baille had never met Maier and knew nothing of her posthumous fame, that doesn’t mean he can’t be named an heir, Meisner said. And while Maloof has the physical images – both photos and negatives, the estate owns the copyright, now that a public administrator is involved in the case. "The copyright isn't worth a whole heck of a lot if you don't own [the images]," said Meisner. "Because you can't print any photographs." Maloof and the Cook County public administator handling Maier's estate, David Epstein, have been "hammering out some kind of agreement" for nearly a year, said Meisner. "This is basically a stalemate." As to where this is all heading, Meisner said that Maloof "is hopeful." And that there could be more of Maier's work to come. "The public administrator has said this, that they want him to continue his work. So one thing that we will start to see is new images of Vivian's, which we haven't seen because they've been kept under wraps while this is playing out." In December 2010, “Chicago Tonight” viewers were first introduced to Maier’s incredible images. She took more than 100,000 photos during her lifetime but never showed them to anyone. 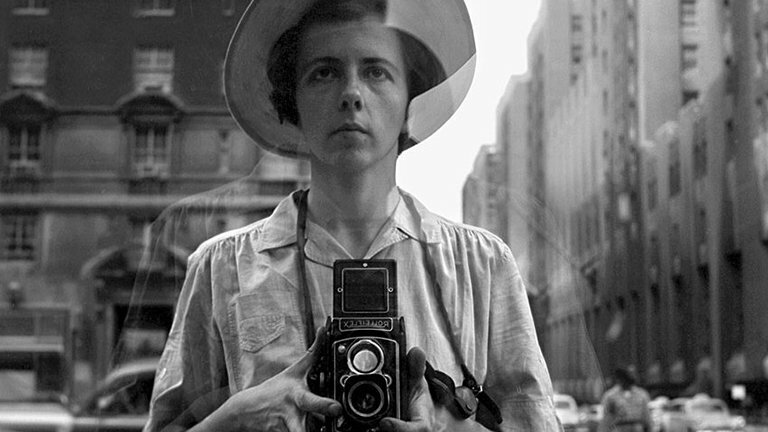 Now that her photos have been discovered, some say she may rank among the top street photographers of the 20th century. Watch the story below. In August 2012, “Chicago Tonight” explored the international explosion of interest in Maier’s work and met some of the other owners of her remarkable archive. Watch the story below. In part three of our series, “Chicago Tonight” introduced viewers to several people trying to unravel the mystery of the celebrated photographer. Watch the story below.